San Jose, CA – A battle is brewing inside San Jose City Hall to remove a statue some say represents violence and genocide. The San Jose Brown Berets last week launched a petition to remove the Christopher Columbus statue from the City Hall lobby, its home since the East Santa Clara Street building opened in 2005. The vandal, James Michael Cosner of Santa Cruz, was arrested and forced to pay for the statue’s restoration — around $66,000. Columbus, who had set out to establish a western trade route to Asia, has been celebrated as the first European explorer to introduce Europe to the Americas. But he has drawn criticism for his harsh treatment and enslavement of indigenous people. At least one prominent San Jose politician of Italian descent defended the Columbus monument. Mayor Sam Liccardo, who is also Italian, said he doesn’t “spend a lot of time thinking about where statues should go” and supports more “concrete actions” to promote racial equality and immigrant protections. The fight over San Jose’s Columbus statue comes amid a national debate over monuments to historic figures some see as unworthy of honor. Monuments of Confederate leaders around the country have come under fire as racially insensitive and an inspiration to white supremacists. Columbus monuments too have come under fire: A Columbus statue in Houston was defaced Friday. Organizers are demanding a statue be taken down in downtown Columbus, Ohio, and a Columbus monument in Baltimore was smashed Monday morning. Ortiz said his group is willing to work with the city to find a better place for the statue. Councilman Raul Peralez‘s office is working on a formal resolution to remove the statue. 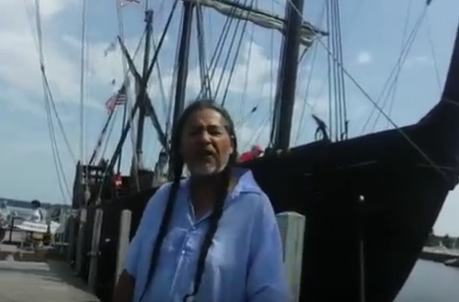 LANCASTER, Pa. — A group is calling for a statue of Christopher Columbus in Lancaster to come down. They appealed to Lancaster City commissioners on Tuesday night. “I ask that steps be taken in the spirit of love and unity to remove this statue from our public ground,” said Edward Woestman. One of the leaders of the group said the national push for Confederate monuments to come down inspired them to take action. 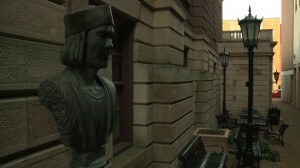 The city council explained that it does not have the authority to remove the statue. It is on county property. The group said it plans to take up the issue with the county. Oberlin, OH will now celebrate Indigenous People’s Day. Is it in anyone’s best interests to disappear the uncomfortable aspects of our own history? Trying to do so seems to be just another effort to avoid dealing with the crises we are facing today, in a country that has not been this deeply divided by race and class in a long time. This is not about disappearing the truth of our history, it is about bringing them up so people better understand our history. When we do, it also explains the racially unfair and class-based unfairness in the politics and economy of the US today. Understanding these divisions will make it more difficult for the wealthy to divide and rule. Ignorance about them is giving them a tool against the kind of economic and racial fairness we are working for. Yeah- maybe that’s what some folks want it to be about – but running around removing statues i don’t think is a particularly productive way of doing it – it only gets another set of folks, who might otherwise be open to dialogue, just pissed off ….